All aboard for some good, ole' fashioned fun with The Wheels on the Bus: Day at the Farm . Based on the perennially classic song, this multi-award-winning series (Parents Choice, Dove, Dr. Toy, iParenting) blends live-action, animation and puppetry - including the voice of Roger Daltry (The Who) as Argon the Dragon -- for an exciting, musical adventure, perfect for children ages 1-5. Day at the Farm , join Papaya, the fun-loving monkey, and his toucan friend, Mango, as they learn about different farm animals plus the importance of good nutrition and how to choose healthy foods. Episodes include "Fill it Up! ", "A Trip to the Market" and "Guide Dogs" (Plus a Visit to the Circus). 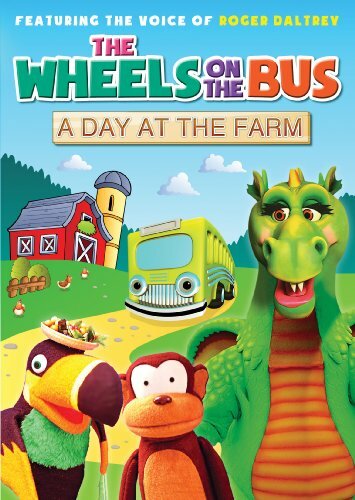 Also currently available for $9.98srp each are The Wheels on the Bus: Day at the Farm , in which kids will learn about all different type of jobs, visit a jungle bird show and a mechanics garage and THE WHEELS ON THE BUS: ANIMAL ADVENTURE, which introduces young viewers to reptiles, bugs, sharks, turtles, dolphins, elephants, zebras and more.